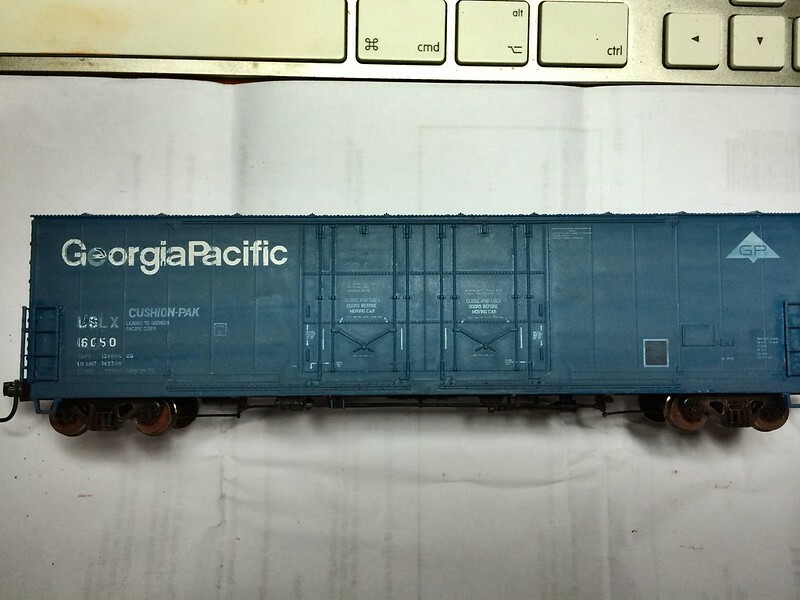 I found this boxcar recently, and is another of a batch of Atlas cars that bought here via the Salvage yard. They are ideal for me to practice weathering. The first of which was already posted here as a sound equipped car. 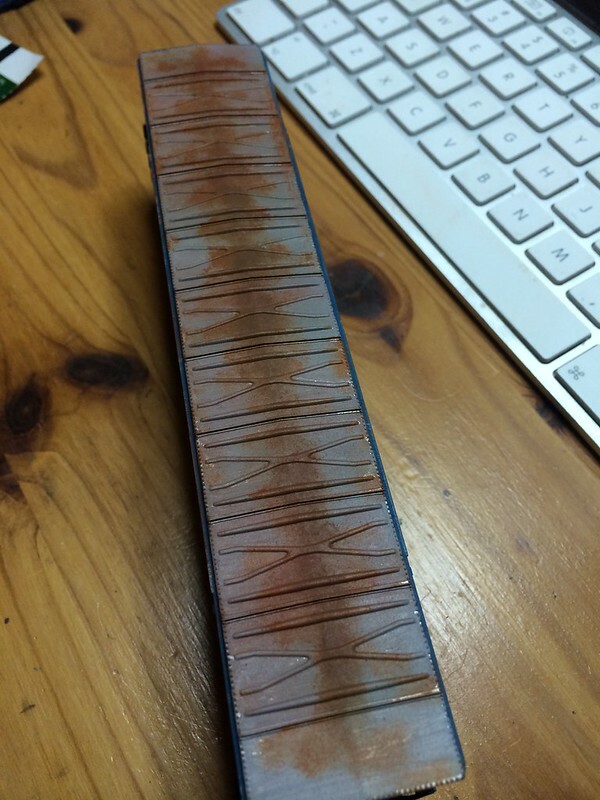 This one will not have sound for now, and I'll focus on the weathering process. 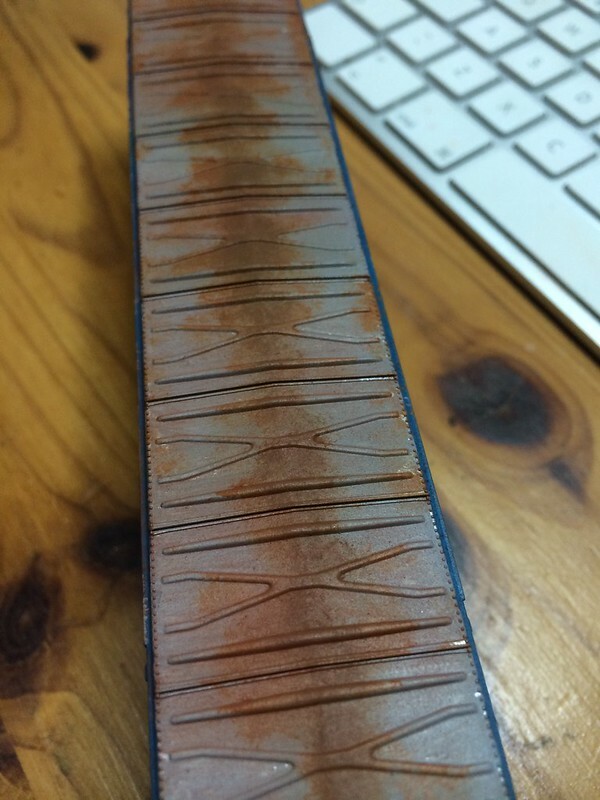 I have searched for a prototype picture to follow but couldn't really find one so I've decided this is a 'fantasy' weathering pattern, but trying to make it look convincing. To start off, first a ' BEFORE' picture. Then we add the first fade with watered down acrylic artist paints, mixed on a plate to resemble a faded version of the original colour. After which I started to gently scrub away the fade of the lettering, slowly developing that faded and worse for wear paint job. Dust'n Rust was next. 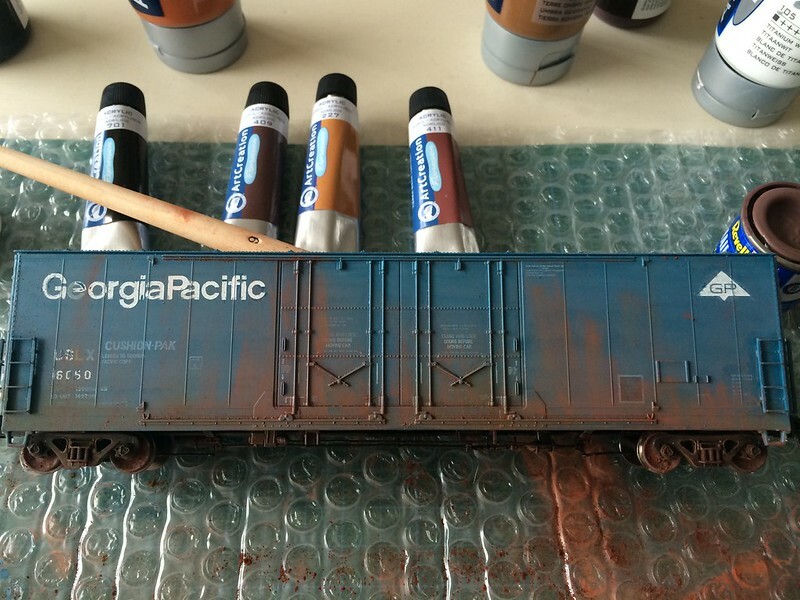 I've used a few different shades of Vallejo weathering powders here to get the first layers of dust and rust on the sides. I've used 'natural umber', 'brown iron oxide' and 'light slate grey' to achieve the effect in this picture. Taking pictures on the progress instantly reveal things you don't always see when you're working on it. Some of the transitions are a bit too hard, and it appears a bit to monotone here and there. I think I'll dust a bit more with some slightly more contrasting colors. So I've added a bit more dust to make transitions a little less stark, and added some scratches here and there, which still need a little bit more halo effect. They were made with acrylic paints on a 00 size brush, which I made wet to get a very narrow tip,and very lightly first applied a 'rust brown' mix, followed by just a fraction of burnt sienna which I faded with a cotton swab, creating the running down effect. Acrylic paints dry fast so once you have the first dark 'scratch' painted on, you can follow with the lighter one within 5 minutes. However the fade needs to be done quick. Apply the paint a scratch at a time and instantly fade it with a cotton swab (or finger tip). Here's bit of a close up of some of the scratches. After that, I'll turn my attention to the roof. So here's my next step. I'm now in the process of rusting the roof. Galvanising the roof to a better shade was not too difficult. While I don't have the colours available as demonstrated so effectively elsewhere on the internet, I mixed up some black and titanium white acrylics and got to a reasonable rendition of the same. Then I started with the stipple process of the roof. Here, I ran into problems. I've not got oil paints, and the oxide orange paint used in the tutorials are nowhere to be found. (it seems a lot of art supplies are switching to acrylic paints, it is more and more difficult to find proper oil based paints. You can get oil paints that dilute with water , to me that's not oil, but closer to acrylic… Maybe I need some lessons there. Anyway, I used a burned sienna and a burned umber acrylic to stipple the roof. 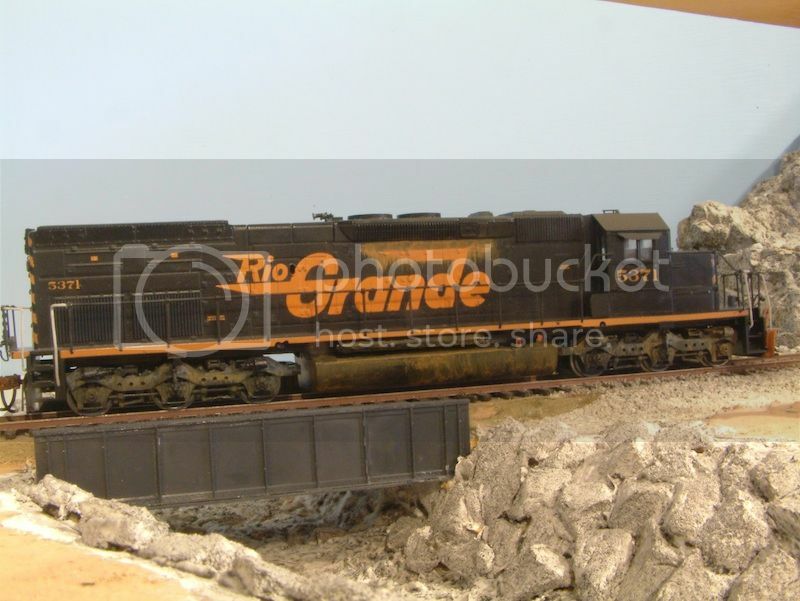 I followed this with some weathering powders. As acrylics dry very fast, I didn't really get the right textured effect, and most of the powders brushed off. While it served to dull everything a bit, and giving me some more variations, I'm still not too convinced of the effect. I think there is some more work needed, but am a little stuck. Anyone any pointers? Not neccesarily about the roof, but one thing - the underframe of a car that weathered won't be black with some rusty bits. I would tend to properly paint (not just drybrush) any visible parts (trucks, wheel faces, brake gear, bolsters, cushion pockets) brown, the acrylic Humbrol underframe dirt is excellent for this, then weather them from there. I agree with Martyn. 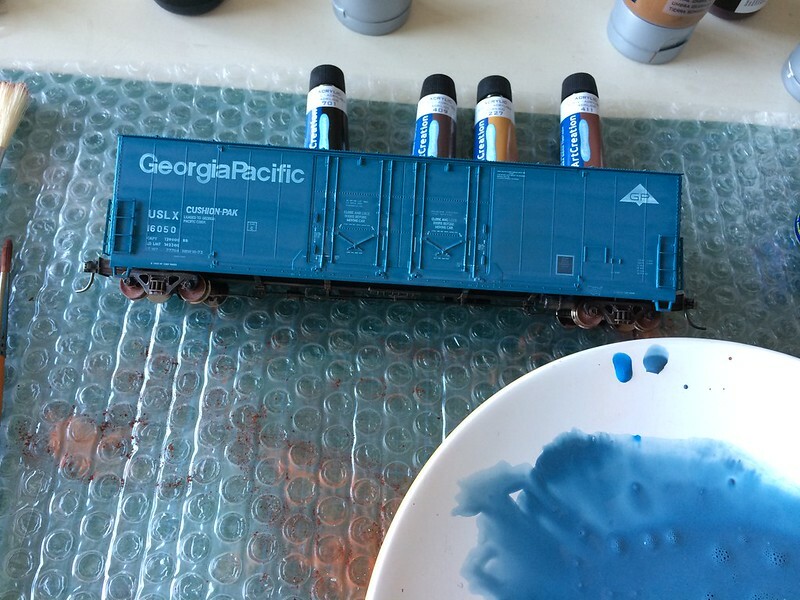 Always paint (best to spray) the trucks, wheels and underside bits and bobs with a basic "grime" colour, ad then add powders on top if wished. 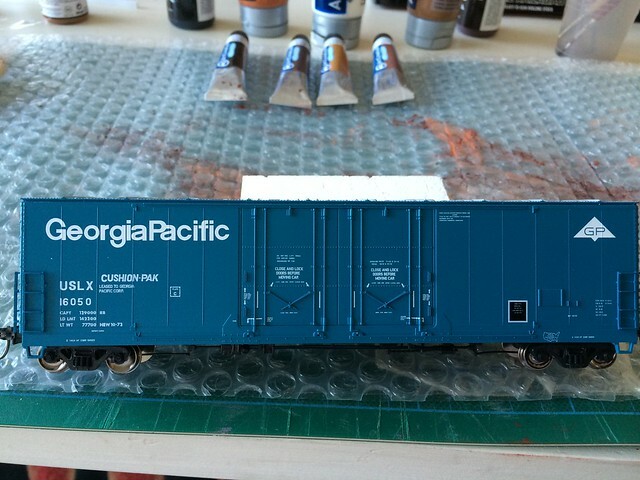 I paint my trucks and wheels with acrylic paint pens, no mess and can be done on the sofa. I don't need to clean the wheel treads either. Thanks for the pointers and suggestion, after I'm done with the topside and 'side sides', the underside will receive some attention. I did put a quick dab of paint on the wheel surfaces to get rid of that shine, and I 'cleaned' off my brushes on the under frame during several weathering steps to tone down the plastic, but a proper 'under frames, trucks and wheels' session is yet to take place. That will be done once I take the under frame off to add additional weight to the car. 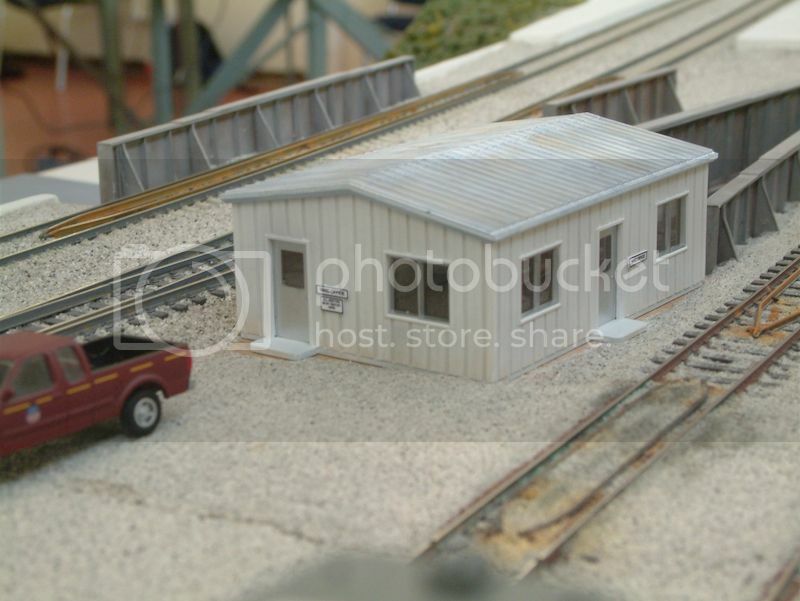 I have used these, 11th Avenue's yard office was weathered with them. My only problem is they take a long time to dry, like pure oils, which is why I gave up using them for figures. The slow drying does mean you can merge other colours in and take your time. The building was sprayed matt white, the diluted oils let you do subtle dirtying. Acrylics work well but dry very fast, when using the paint pens I have a brush in the same hand, as soon as I have put the paint on I wipe it down with the brush, Western Distribution was done that way. It gives the faded slightly streaky appearance. My figures are done with acrylics in tubes. I bought a 24 colour set, which with mixing gives all the colours I need. Larry's scrap was also weathered with these. 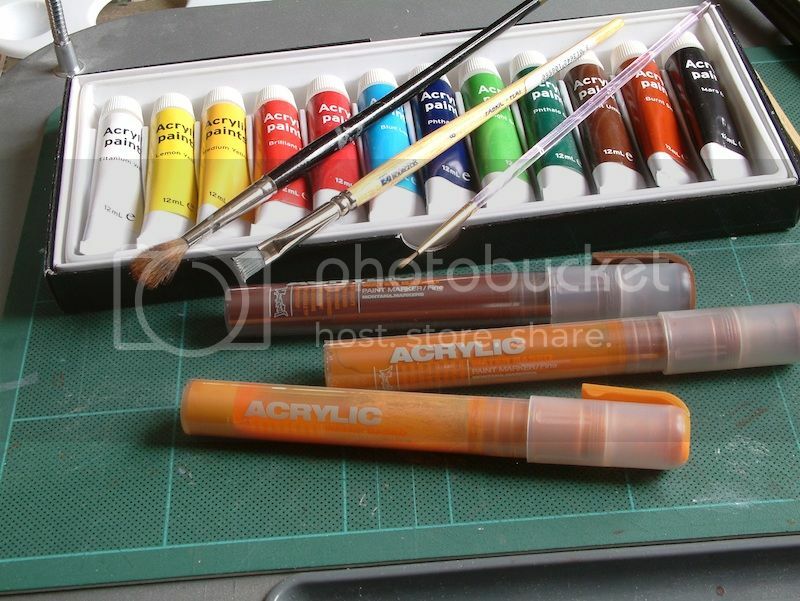 It is good to know that water soluble oil paints work similar to 'real' oil paints. It's the longer drying times (and therefore mixing/blending oportunities) that I am after. I also use Acrylics for buildings and like you like the somewhat streaky effect it gives. I've done a few buildings on my Tree Point module project that way. 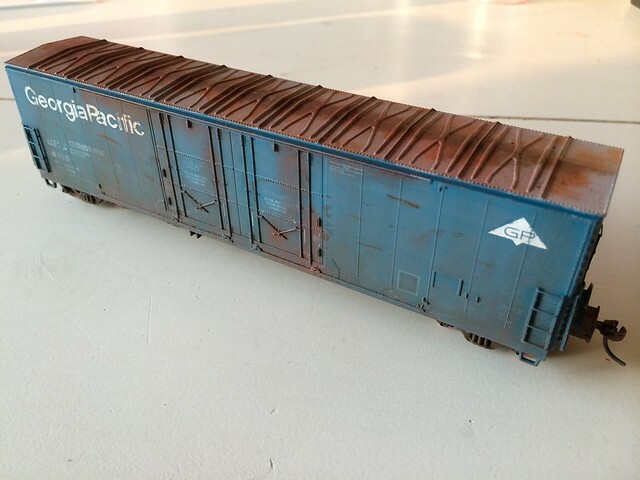 My latest weathering attempt. Mostly using the techniques as described by Gary Christensen in the August MRH and on his website the Weatheringshop. I did divert a little in that for this car I didn't have any oil paints so have compromised here and there. I have learned a couple things doing this car, but it is still a reasonable rendition of a weathered and somewhat neglected car. It's by no means a 'rent-a-wreck' as Gary likes to model. My next attempt will hopefully include some oil paints to practice with, and most importantly, a few prototype snaps. Below a before and after picture. I've had a go at weathering just using Acrylics, pens and cheap tube paints, all brushed on. The cars have a thin wash of white with the flat brush that is then almost removed with the mop brush, side stakes have a thin black wash in the corners once again brushed off. The trucks and wheels are done with paint pens. 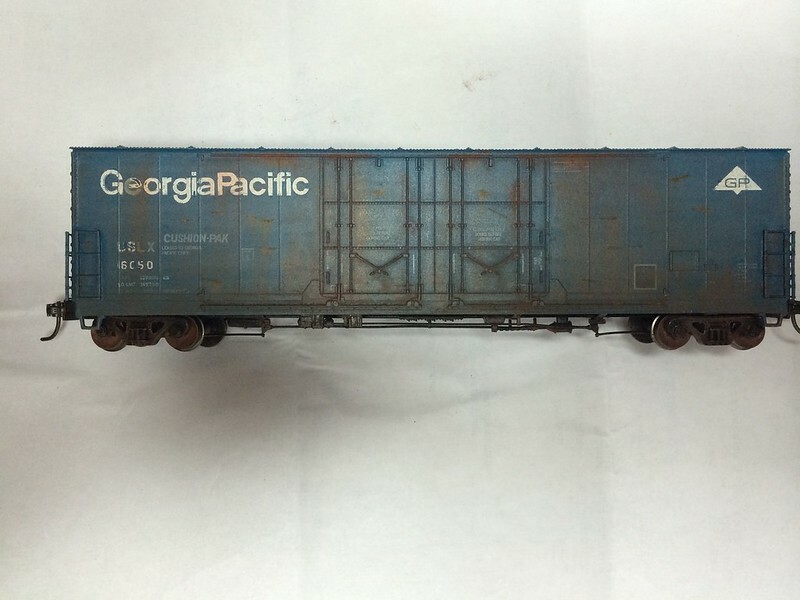 A very old Athearn car, 30+ years, with slight fading. 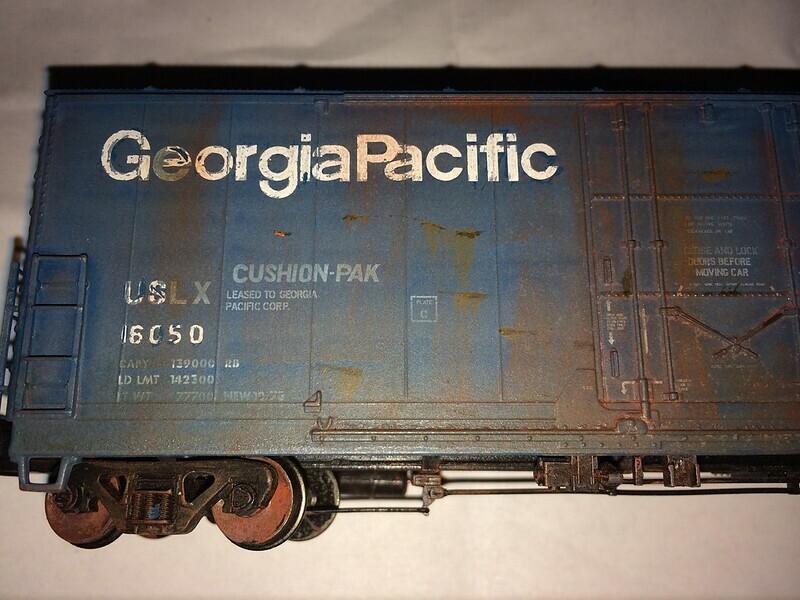 Another covered hopper, with a white wash again but heavier under the hatches and rust scrapes done with the small brush and dragging down with the flat brush. 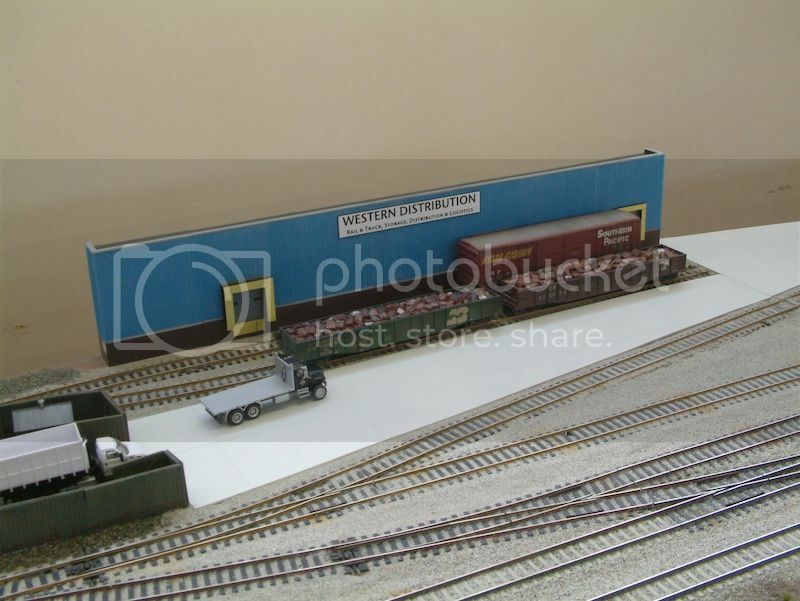 A box car, the rear one is factory finish. This car has rust on the door tracks and roof, done with paint pens. A gondola, inside was done with a paint pen, spread with a brush. 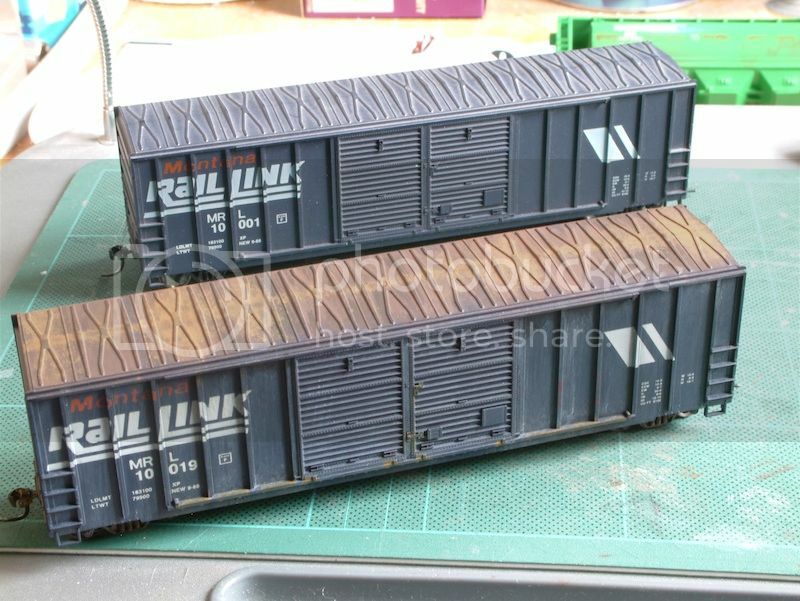 The outside rust panels were done with tube paint onto a wet very thin black wash.
Acrylics (as your pens) are very easy to work with, and forgivable too (as long as they are thinned, direct applications dry far too fast for my liking, which is where oils etc come in). May I suggest you dilute the paint even further though, to a watery consistence, and dry it off with a hairdryer from a safe distance. It will take a few extra layers, but it will give you more control, and it won't give you streaks, if you're after a fade of course. (Do use a layer of dulcote before you start and between layers so that the paint has something to adhere too). The hairdryer makes quick work of drying that too, so you don't have to wait long until the next layer is applied. If you are looking for streaks , then obviously thicker applications will be the way to go. Well I'm breaking the rules, I don't clean the cars first, apart from brushing off dust, I don't dullcoat either before or after. Even the washes dry in a few minutes, I apply one colour over another often before fully dry which tends to blend them a bit. 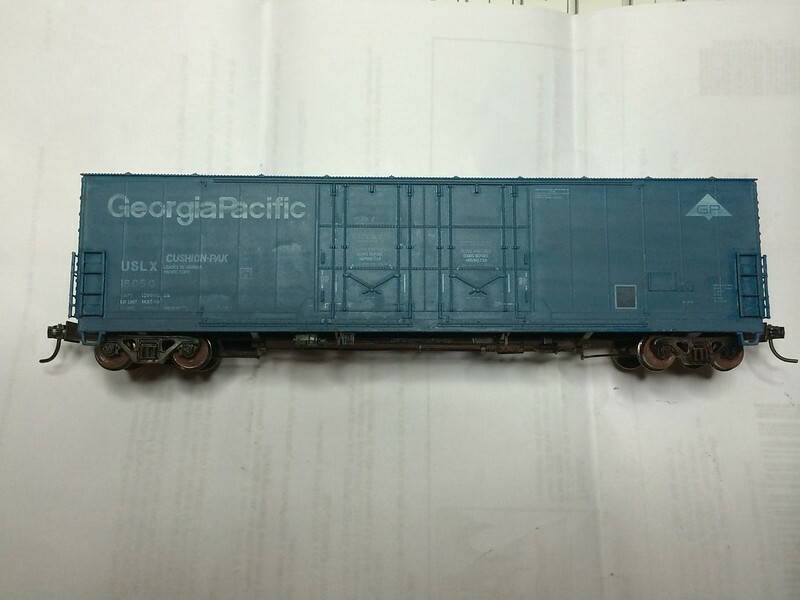 The ATSF hopper was a thinner wash with very little streaking. The CN car I wanted much more streaking. I don't thin the paint pens, but do brush the paint off within seconds to give a weaker colour and fade the edges. 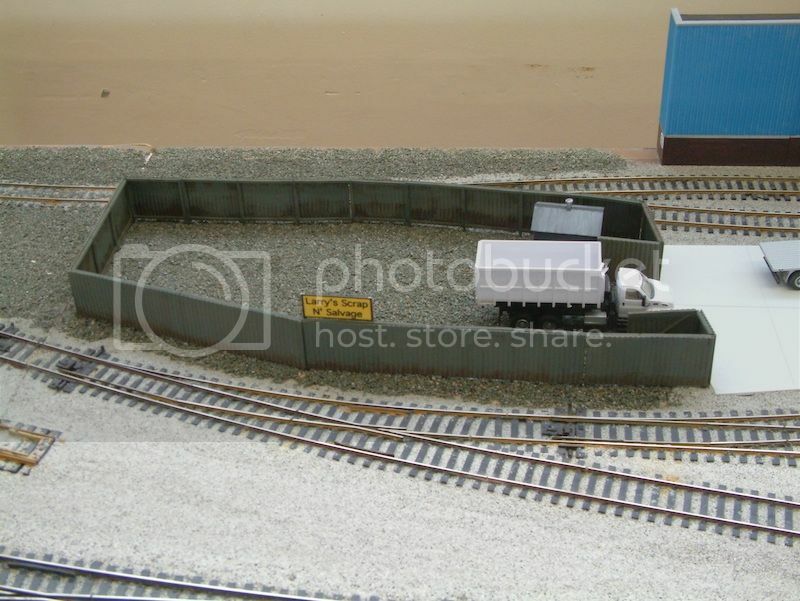 The roof of the MRL box car shows that, though it needs a second coat, probably with less brush work. The exceptions are bearing caps, inside trucks and wheels which are straight from the pens. 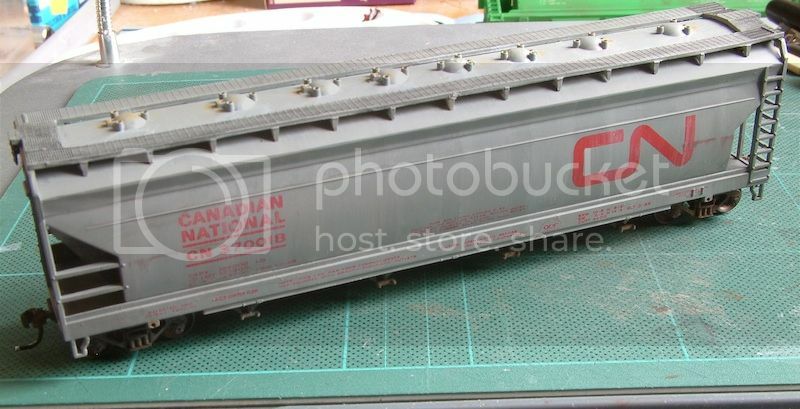 Mention was made of car undersides, this photo shows the CN hopper. I just made this up as I went. 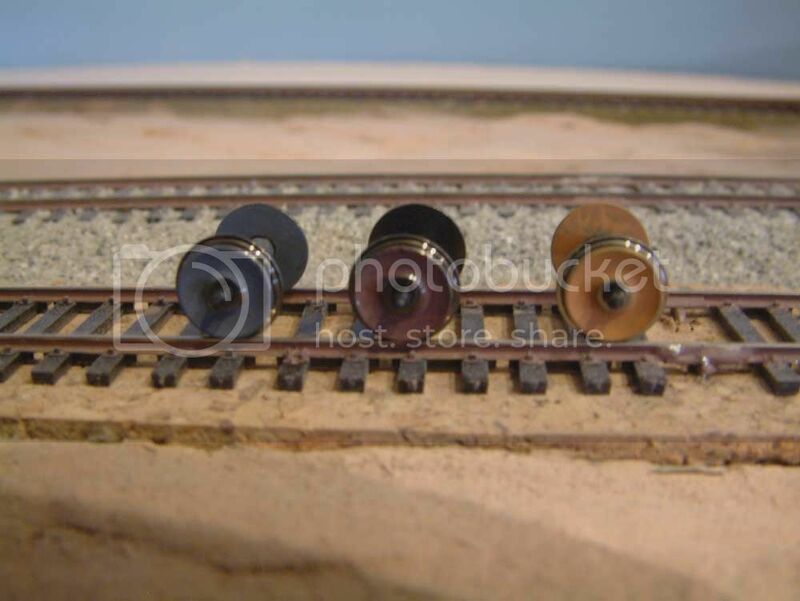 If you look closely the detection resistors are visible on the outer wheelsets.